In retrospect, Friday should have been Bud's last day of school. That sort of thing is always so much easier to see in retrospect, isn't it? And there it is, clear as day from this vantage point: Friday was the last "regular" school day, when routines were the same and the flow of the day was predictable. But I'm always afraid to set low expectations for Bud, to assume that "he couldn't possibly" or "he would just never." And so we ventured forth into these final two days; I tried to prepare him for the out-of-the-ordinary activities that would end the school year, and I hoped for the best. 3. Bud would sit in the audience with us. I didn't consider the fourth option: Bud would pace the classroom, furiously scripting something about going with Mom and watching the kids from his apartment building, as the parents arrived. He would get more agitated upon seeing me, and would burst into tears when he learned that we would not, in fact, be going to our apartment building (since we do not live in an apartment building). Bud would sit in the hallway with Mom and Dad, sobbing loudly, while the other children sang. A clear-thinking person would chalk that up as a learning experience and exit the school year gracefully at that point, don't you think? But not me. I didn't want Bud to miss the last day of school's "Fun Day." It was a lovely school-wide celebration with music, games, and a bounce house for the Kindergarteners. But it was just too much for Bud. I was there with him again - and again, he wanted to go to his apartment building. For the first hour or so, the other children made crafts while Bud registered his protest in shrieks and bellows: "No! You can't make a necklace!" Things got better once the activity moved outside. He made it through the whole afternoon by seeking out activities after other children had abandoned them. He spent most of his time at the sponge relay site, where the other children used sponges to transport water from one bucket to another. Bud used the sponges to transport water from one bucket to his head. But he did bounce in the bounce house when one of the girls in his class took him by the hand and invited him in. And he did enjoy his ice cream, even though he insisted that we take his ice cream back to the classroom instead of eating outside with everyone else. The fact is, he did a lot better at Fun Day than I did. I was tense and anxious for the duration of the seems-like-four-days-but-is-really-just-three-hours event. 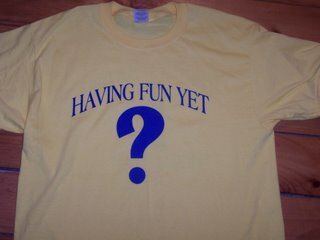 My dysregulation was heightened by the fact that when I arrived I was handed a "Fun Day Volunteer" t-shirt - bright yellow, at least two sizes too big, and so long that it covered my shorts and made me look like some kind of miscreant creeping around the schoolyard with no pants on. So, Bud's Kindergarten year ended more with a shriek than a bang, and I've made mental notes so that next year we will plan differently for these year-end events: scale back expectations, plan an escape route or two, get a smaller t-shirt or wear long pants. But, of course, you never can predict these things - sometimes you plan for the worst and get the best. Sometimes you just have to grit your teeth, get through it, and hope that later on you'll be able to find the humor in it. One thing is certain: nothing can diminish the fact that this was an extraordinary year for Bud. And that's a fact that remains the same no matter what your vantage point. oh my, the too-large t-shirt and the pantless look totally cracked me up, as did the message on the back of the shirt!lol! i think i would have been feeling the SAME AS YOU throughout those days. but the point, as you say, is that yes, yes yes! it's been an extraordinary year and you have lovingly and beautifully chronicled it for us all. thank you for that and congratulations to all of you! Very funny about the shirt! You are so right, reading about Bud's year...it was, he was/is extraordinary!!! Henry's been saying a lot of things like "No! You can't make a necklace!" It's a rough season for all of us. MOM - it is going to get better. Next year, please do have the same high expectations for Bud! Bet he surprises you. My child had a very similar reaction at age 4 to the end of year daycare party. Now, at age 9, she is perfectly fine with all these things and even looks forward to them - although she is still scared to go down the big bouncy slide! what is was- school is ending!!!! A new world awaits called Kindergarten and my son wants none of it!! Thank you for your insight. You are right that it doesn't take one moment away from Bud's great kindergarten year though. We torture ourselves either way don't we? We feel guilty when we "exclude" them then we feel guilty when we include them and they end up hating it. Going through the same thing myself: today was Isaac's Kindergarten graduation and we decided not to bring India to the celebration. I know she would have hated it but I can't help but look at the India-less pictures and hurt a little. PS. Congrats to you and Bud for a wonderful school year! Endings are tough for Charlie. I think he's feels the pressure and the build-up, and responds in kind----he's not one for ceremony. Did you figure out what he meant about the "apartment"? We could all use a shirt like that (in a smaller size)! Happy End-of-School-Year to Bud...and you, of course! Sorry about the "Fun Day" festivities, though. (Psst! I've never been a big fan of those, either). Thank Bud for turning me on to a great show...I finally saw "Jack's Big Music Show" today. They sing some catchy tunes. Unfortunately, Mom made me change the channel halfway through. Another year of great progress and joy of watching Bud grow. HOORAY! I can look at Gabe now and know when he is reaching his limit. He also starts scripting when a room gets overly crowded or music is on that he doesn't like. I thank God now for the small signs Gabe gives me that he either needs help, is uncomfortable or we need to leave. He used to just throw himself on the floor. No we can leave with spirits intact. Love the shirt! I definitely need one! Sounds like Bud and Sweet M had similarly amazing years and denouement (sp?) year end experiences! Onward to another great year . . . I thought it might be from the Sesame St show!